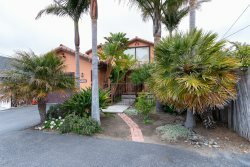 This townhouse-style condo is located just a few blocks from the state beach and a few miles south of Hearst Castle. The unit includes linens, Wi-Fi, a washer/dryer, 2-car garage, enclosed patio/deck off bedroom downstairs with additional deck off living room upstairs, which offers an ocean view! *Monthly Rental Only - Rates, Descriptions, and Units are subject to change at any time! * Occupants must abide by HOA's Rules & Regulations and CC&Rs.